The naughtiness of Peter Rabbit meets the comforting repetition of Goodnight Moon in this perfect bedtime read-aloud for rambunctious bunnies everywhere. Here's the perfect bedtime read-aloud for the very youngest child. 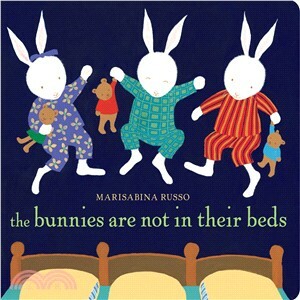 Filled with fun noises--click clack, click clack--and a repeating refrain--good night, good night, sleep tight--this story is sure to have kids chiming in as they follow the antics of these bunnies who won't stay in bed. Kids will identify with these mischievous bunnies and their desire to play--while parents will empathize with Mama and Daddy's struggle to get them to SLEEP. MARISABINA RUSSO is the author and illustrator of numerous books for children, including?I Will Come Back for You: A Family in Hiding During World War II, which?Booklist?called a "moving picture book [that] tells a story of sorrow, fear, courage, and kindness," and?A Very Big Bunny, about which?Horn Book?wrote: "This gets at the heart of the ordinary child experience with emotional truth and sensitivity."